A 3-tier wedding cake with pink sugar roses, calla lilies and butterflies. Top tier- Rich chocolate sponge layered with chocolate buttercream and dark chocolate ganache. Middle tier- Vanilla bean sponge with vanilla bean syrup layered with fruity summer berry buttercream. Bottom tier-rich fruit cake. Delivered to Abbey House Hotel. Congratulations Chloe and Robert! Here are some of the 80 wedding cupcakes which were set up in the great hall at Abbey House Hotel. 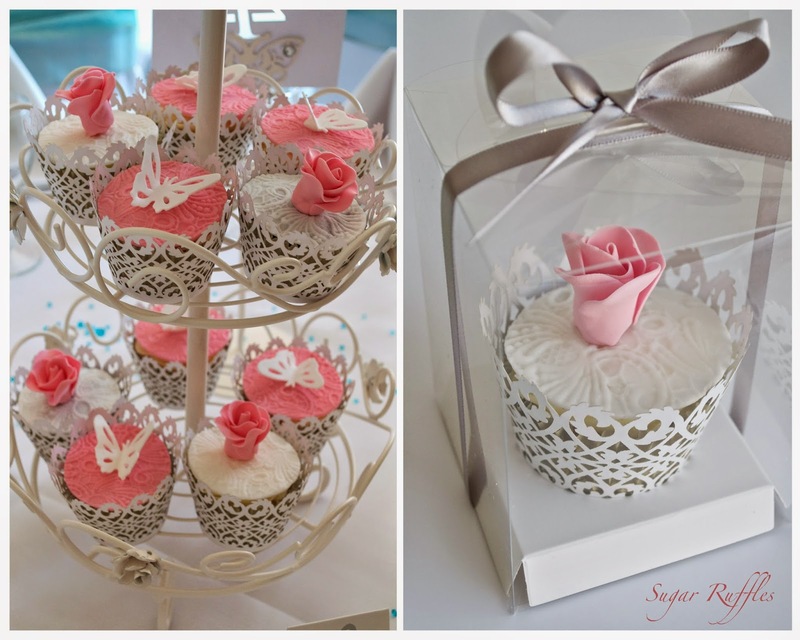 Topped with pink and white lace, roses and butterflies and presented in filigree lace cupcake wrappers. Cupcake flavours- Vanilla, lemon, carrot and chocolate orange truffle. The wedding cupcakes were displayed in tiered cake stands, as centre pieces, on each table. The top tier of each of the stands was filled with flowers to match the bridal bouquet. 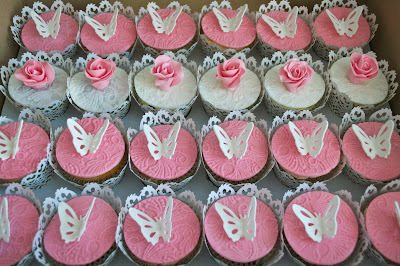 The top table cupcakes were individually boxed and tied with silver ribbon. As well as being her wedding day, yesterday was also Chloe’s birthday! Her husband-to-be Robert, contacted me to arrange a surprise birthday cake for her. The cake was a ombre turquoise colour to match the bridesmaid dresses, with butterflies to coordinate with the wedding theme. 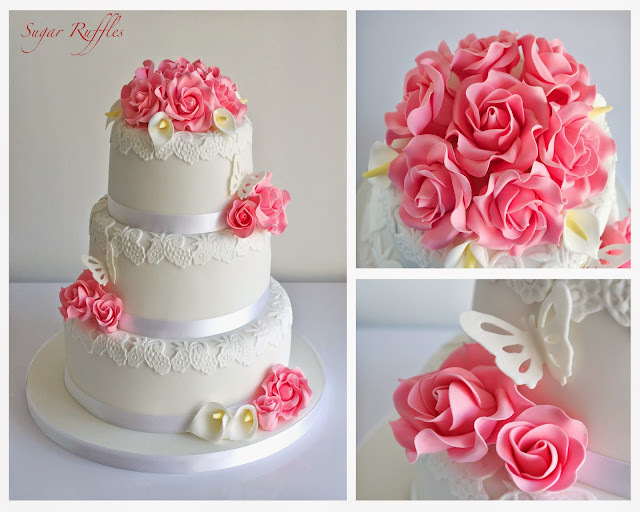 The cake was to be brought out as a surprise for Chloe at the reception.